I always look forward to Melody Carlson's annual Christmas novel. They're a little bit inspirational, a little light. There's usually a little romance. And, there's always the Christmas spirit expected this time of year. In fact, The Christmas Joy Ride has more of that Christmas spirit than usual. Miranda Farmer is amazed that her eighty-six-year-old neighbor, Joy Jorgenson, is planning a major road trip in her RV. But, Joy sold her house in Chicago, and she's moving to Phoenix to be with her sons. And, she has one last chance to share some "Christmas Joy" before her move. Joy loves Christmas, and she ran a contest on her blog, "Christmas Joy". Now, she's taking her RV along Route 66, delivering Christmas to deserving people who wrote to her blog, saying they needed some Christmas joy. And, maybe it's Miranda who needs that Christmas joy the most. At thirty-seven, she's divorced, unemployed, childless, and about to be homeless because the bank is foreclosing on her house. It's with a little trepidation that Miranda accepts Joy's invitation to ride along. But, she's just like Joy's Christmas recipients, "regular folks who've fallen onto hard times". There's never quite enough character development in Carlson's short novels, but, in the case of Joy and Miranda, the reader does get to understand them. However, there certainly is a lack of development with one of the characters at the final destination on the trip. Even so, Carlson, through the character of Joy, succeeds with this year's message. "The spirit of Santa is real. It's the spirit of love and giving, and I like to think that it's symbolic of God's love and generosity." Ready for a holiday road trip with some sentimentality? 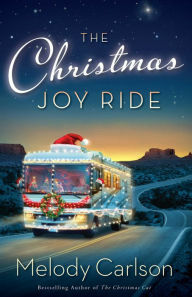 Buckle up with Joy and Miranda for Melody Carlson's The Christmas Joy Ride. The Christmas Joy Ride by Melody Carlson. Revell. 2015. ISBN 9780800719678 (hardcover), 168p.